Inflation was a persistent trend in the Japanese economy in the 1960s and 1970s. Sometimes it went out of control and was dubbed hyperinflation; in other times prices showed relative stability. This section will sketch the process of inflationary development and survey its main sources and effects. Inflation is never a merely economic phenomenon; politics is deeply involved in its process. Some attention will therefore be paid to the political aspects of the problem in the latter part of our discussion. 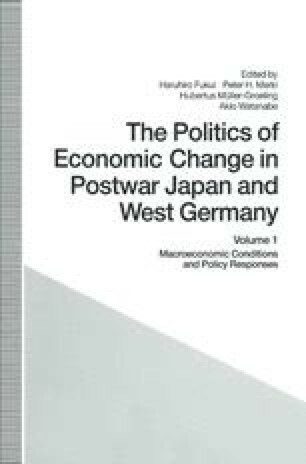 Since our principal purpose here is to provide a basis of comparison of inflationary experiences in postwar Japan and the Federal Republic of Germany, broad patterns rather than specific details will be emphasized. The relevant institutional arrangements will also be briefly described.